I knew when I first saw this show it was going to break my heart. It was too cool to hold up on network TV. It blends science fiction with relationship drama and a hint of philosophy, somewhere between Firefly and Being Erica. It started airing during the summer of 2009, it went away, it came back it went supposedly on hiatus, and in the end the only place to see the last episodes was on DVD. The story is partially in flashbacks, but the “present” is the year 2052 and a group of astronauts is about to embark on a landmark journey to seven planets, over six years. The story is told primarily through the eyes of the first character we meet, Maddux Donner (Ron Livingston). The opening scene is dark and concerting, showing us a sad picture of Donner’s life at home with his father, who is either an alcoholic or senile, or both. The dreary room is lit only by the television where a group of smiling astronauts is introduced. Donner’s father asks, “Which one are you?” A flashback shows us the tragic end to Donner’s space travel career, as he is forced to leave the surface of Mars amid a storm with two crewmates still on the planet’s surface. Although the next scene is one of exuberant celebration, opening the pilot this way sets a tone that we, the viewer, cannot shake. Heartbreak lurks beneath the glossy, high-tech surface in this future. The episode is sprinkled with mentions, by the ground control team, of an “it” that is being kept secret from the crew. To be honest, these didn’t catch my attention on first viewing, but in hindsight they hold much significance. The next character we meet is Zoe Barnes (Laura Harris, playing the polar opposite of her Dead Like Me character). With a simple look between her and Donner, the romantic tension is established. Later in the episode it is suggested, if not spelled out, that the two characters have a history. Ted Shaw (Malik Yoba) was Donner’s partner on the Mars mission, and though the two of them still work for the International Space Organization, they are marked forever as the men who abandoned their crewmates. The Mission Commander is Rollie Crane, whose new wife Jen is also part of the mission. Also on the crew are Nadia, Paula, Ajay, Evram, and Steve. We get a snippet of each one as they talk into a camera, reality show-style. The show’s creators didn’t waste time or energy making the future look “futuristic.” A bar still looks like a bar, and people still wear jeans and tees. They saved the budget for the ship, The Antares. There are beautiful images of the expanse of space, seen through panoramic windows in a shining, pristine vehicle. The business of explaining the technology is accomplished by having one of the crew members, Paula, carry around a mini-DV camera and talk to an audience of school children. There are holes in the science, of course. It is explained that the astronauts’ suits have special fibers that pull them toward the floor of the ship in the absence of gravity. Yet, their hair lays flat. Not being a physicist, I am probably missing other problems as well, but the story is exciting enough to let those go. Odd things are happening to both Donner and Zoe. Donner is having dreams about being on the mission and seeing Zoe float naked out into the vacuum of space. Zoe is hearing the far-off sound of a baby’s cries. In flashbacks, we are filled in on the fact that Zoe got pregnant during training, but had an illegal abortion. These moments are just breadcrumbs at this stage but promise to lead to something amazing, possibly frightening. 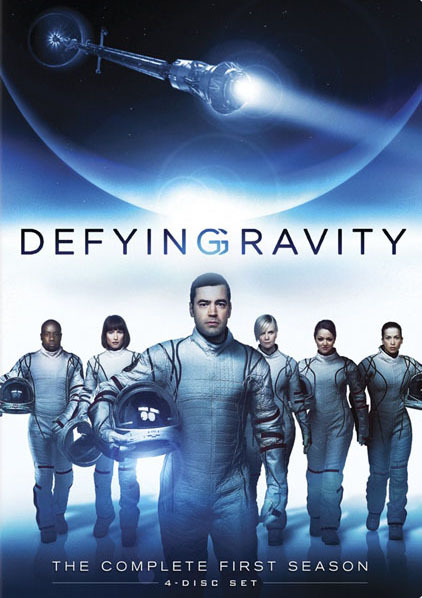 The twist in the plot comes when two of the crew members, Rollie and Ajay, already aboard the space station orbiting the Earth, suddenly develop identical and unusual heart conditions. Before the ship can start on the mission proper, Donner and Ted must be subbed in for the two ailing astronauts. Ted knows the secret—whatever it is—that mission control is keeping from the crew. The question raised, the theme of the episode, is whether fate determined who was on the mission and who was not. We are promised more back story about the training, which may answer that question. But the show appears to be one that will raise as many questions as it answers. Though many viewers blinked and missed Defying Gravity, I’m not the only one to appreciate it; here is a good analysis from Spill.com. This entry was posted in 2000s, Dramas and tagged antares, defying gravity, future, laura harris, maddux donner, outer space, ron livingston, space travel by meekthegeek. Bookmark the permalink.